Here's a very late but completed challenge! A few weeks ago, the Tuesdays With Dorie baking challenge was Dorie's Brioche Plum Tart , chosen by Denise of Chez Us (who has the recipe within her blog). 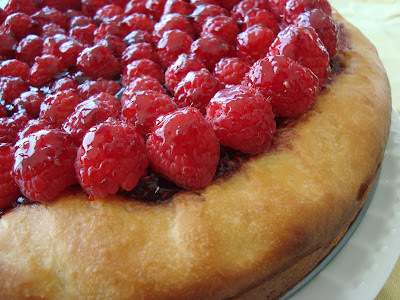 Rather than doing plum, I chose to make a Brioche Raspberry Tart instead so I could use up some leftover raspberry preserves and take advantage of the sale on fresh raspberries at the store. This recipe involves creating a "poor man's" brioche dough as the base of the tart. The term "poor man's" is a way to describe how much butter is used in the recipe. 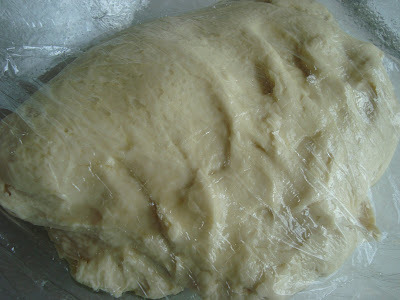 The recipe for the brioche dough didn't contain quite as much butter compared to other brioche recipes, hence the name, "poor man's" brioche. The brioche dough is made with yeast, milk, flour, sugar, salt, butter, eggs and vanilla extract... what's not to love? Everything is combined and kneaded in a stand mixer before allowing to proof before chilling in the refrigerator overnight. After the dough has been chilled, it's placed into a tart pan (or in my case, my springform pan). Raspberry jam is spread on the brioche and baked for 20 minutes. 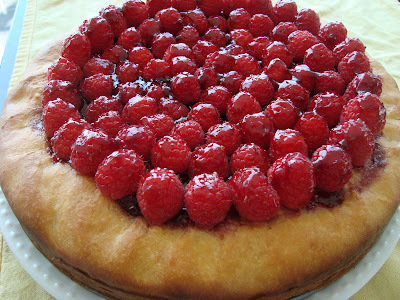 Once slightly cooled, I topped the tart with fresh raspberries. 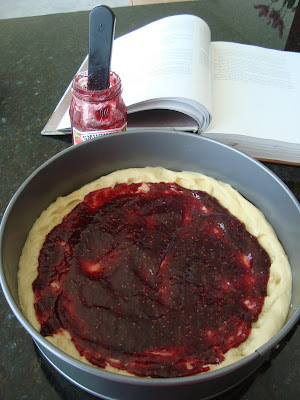 For an added touch, I brushed on my raspberry jam I reserved so it would give the fresh berries a nice glaze. I really enjoyed this recipe and how can any fruit topping taste bad with a buttery brioche base? I also enjoyed how versatile the recipe is to use other fruits including apples, pears and even mangoes!